I remember vividly the first initial public offering I worked on as a young and eager investment banker in 1994. I had joined what was then the largest investment bank in London as a graduate trainee with the 1991 intake. I spent the early years of my career writing briefing notes and working in the debt capital markets department, executing long-dated mortgage debentures and sterling-denominated bond issues for property developers, co-operative societies and brewers in the North of England. I longed for transactions that had a more international flavour and had just transferred to the equity capital markets (ECM) team, where people seemed to be permanently flying to exotic locations such as Argentina or India, living a champagne lifestyle and flying first-class to pitch to banks, oil majors and media companies. After only a few weeks, most of my new colleagues decamped to join a rival firm on absurdly high guaranteed remuneration packages, and I found myself, alongside a handful of other bewildered bankers who had been left behind, tasked with executing the IPO of a relatively small issuer from Sweden. The company’s headquarters were located about one hour outside Göteborg, and I became accustomed for a number of months to being picked up at home by a chauffeured car, once a week at 4:30am, to catch the early morning flight at Heathrow. The issuer was a textile retailer specializing in underwear and similar apparel for middle-aged women. The company was owned by a couple of private equity investors focused on the Nordic markets, and the CEO and the CFO were two stout men of a certain age, with no experience whatsoever of capital markets. That was just as well, as I had never worked on an IPO myself. We were, however, fortunate in having a talented research analyst involved in the transaction, who had taken a part in the pitching process (something that would be unthinkable nowadays). I have fond memories of helping to organize site visits for the syndicate of banks, of accompanying a dozen alpha males dressed in pinstripe suits to tour downtown shopping malls in small provincial Swedish communities, frightening housewives away from the shops, and of trying to understand the intricacies of product display, supply arrangements and point-of-sale technology. I recall training the senior management for their roadshow presentations and having great difficulty in getting them to master the pronunciation of the word “lingerie”. I also remember doctoring the pre-deal research report to make it more “punchy”; spending much longer than was necessary to choose the picture of the attractive and (dare I say it?) scantily clad model that would figure on the cover of the prospectus; marveling at what appeared at the time to be an unlimited expense account when on the road with management; and flying on a private jet to Stockholm for the closing dinner because the managing director in charge of the transaction wanted to sleep in his own bed in London that evening. How things have changed! Following the “dot com” crisis, the collapse of Enron, Arthur Andersen and the more recent credit crunch, going public will never be the same again. In most markets, research analysts have now been banished for good from corporate finance departments and no longer can shape and spin the stories that help win IPO mandates. In turn, ECM bankers are no longer permitted to lend a heavy hand to research analysts’ reports to entice institutions to pile into hot issues. Risk factors now account for sometimes a quarter of prospectuses, and comfort letters from accounting firms come in various versions to limit their liability in what have become litigious jurisdictions. Companies no longer need to seek listings on the New York Stock Exchange to raise ten-figure proceeds, and (who would have guessed it only ten years ago?) issuers from mainland China now regularly top the lists of the world’s largest IPOs. Corporate governance and compliance have become a major focus of regulators in the financial industry. Complex, new valuation methodologies have been introduced alongside the familiar price-to-earnings and price-to-book ratios. Largely unheard-of categories of institutional investors have made their mark, such as sovereign wealth funds and hedge funds, both of which are now price leaders, major players and participants in new issues. All the same, the process of coming to market still remains a daunting one, particularly for those who have never worked on an international IPO (by which I mean an IPO that is marketed to a reasonably wide universe of investors, both retail and institutional, as well as domestic and international). A large number of parties need to be appointed and seamlessly coordinated and many different and unfamiliar tasks must be simultaneously conducted. Executing an international IPO can take months, and can cost large amounts of money. It is easy to get lost within the jargon and the myriad of rules and regulations that govern the various aspects of listing a company’s shares for the very first time. It is also easy to get things wrong, which could prevent an issuer from tapping investors for more funding for years to come. 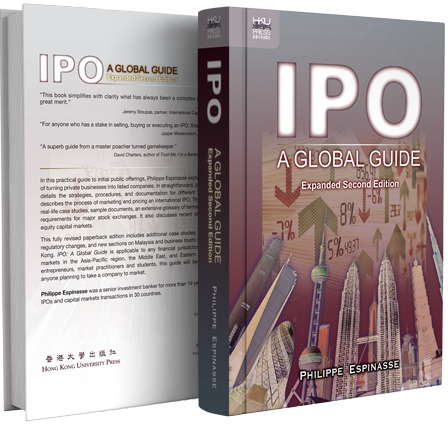 This book looks beyond the theory and is intended as a guide to conducting international IPOs for entrepreneurs, corporate management teams, private equity and venture capitalists, market practitioners and students in finance. Guides issued by stock exchanges tend to focus primarily on listing criteria, while those published by legal advisers, consultants and audit firms usually only address that part of the issue process related to their particular area of expertise. Books on equity capital markets more generally also often include a plethora of mathematical formulas or lengthy academic studies of the performance of, or anomalies associated with, past offerings. By contrast, my approach has been a purely practical one and is based on my experiences of working as an ECM banker on the origination and execution of a variety of transactions across some 30 different countries. 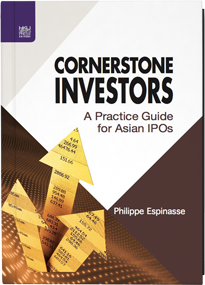 While the book is global in its outlook, I have included many examples from IPOs undertaken by issuers from the BRIC countries (Brazil, Russia, India and China), in addition to the US, the UK and continental Europe. At the time of writing, the third largest IPO on NASDAQ over the previous two years was by a Chinese issuer. Over the same period, the second largest IPO on the New York Stock Exchange was by a Brazilian bank, and on the London Stock Exchange by an Indian energy company. The Asia-Pacific region in particular is the one that now exhibits the largest deals, highest transaction volumes and number of new listings, so it is only natural to convey developments in that fast-growing part of the world. 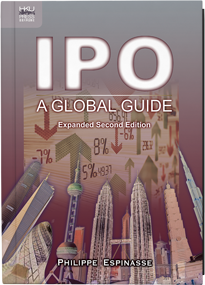 The second largest-ever IPO world-wide (US$22.1 billion) was, after all, made by a bank from mainland China in 2010 (as was the third largest-ever IPO, in 2006, with the fourth largest flotation made by an insurance company listed in Hong Kong in 2010 and the fifth largest by a Japanese telecommunications company in 1998). Asia has also been at the forefront of innovation, introducing (and sometimes successfully adapting from the US) products such as real estate investment trusts (REITs) and listed infrastructure funds, which Europe has only more recently embraced. I have examined in detail how investment banks are organized, how they work with each other, as well as with their corporate, institutional and other clients, and with third-party advisers. I have also included tips, real-life examples and case studies, and attempted to address all the practical aspects and building blocks associated with bringing a business to market. These include documentation, legal, accounting and corporate governance issues, valuation considerations, as well as a detailed analysis of marketing aspects. 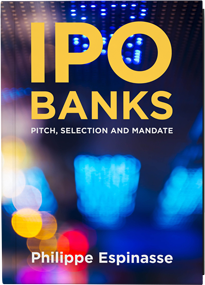 The processes of dual-track IPOs, pre-IPO investments and appointing cornerstone investors-as well as institutional investment styles, public and e mployee offers, pre-deal research, investor education, roadshows, bookbuilding and order solicitation, pricing, allocation, listing and price stabilization-are explained plainly and simply. Lastly, I have also included in the appendixes detailed check lists for due diligence, issue expenses and prospectuses; sample forms for investor education and order indication; details of initial listing requirements for major stock exchanges around the world; and an extensive glossary with definitions of more than 550 industry terms, as well as an index for easy reference. More perhaps than in other industries, however, regulations do change frequently and individual circumstances very much do matter, so I would, in all cases, caution readers to consult their investment banking, legal, accounting and other advisers as well as the relevant stock exchange listing groups when considering any capital raising, sell-down and listing. 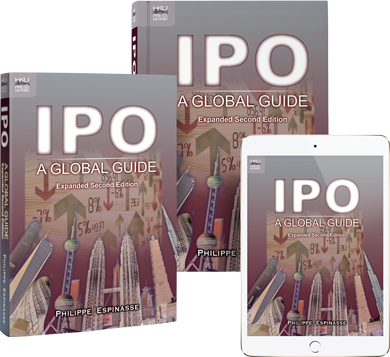 Conducting an international IPO is the culmination of years of hard work for management teams and corporate shareholders, and can bring many rewards, both financially and in successfully funding and implementing ambitious business plans. At the same time, it makes companies more accountable and vulnerable to market forces. Mastering the process and understanding its building blocks are key to making the most of what a flotation can offer. I hope this insider’s guide will help travellers plot the course and navigate through this exciting journey.